Cancer is one of the most devastating diseases on the planet. So many people that are affected by so many different types of it that it is almost impossible to measure the true effect it has had on our cultures and our lives. Because of the debilitating nature of the disease, a cancer diagnosis is the worst nightmare for almost everyone, especially considering that many different kinds of cancer are incurable. Even when it is overcome, cancer survivors are left ravaged and weakened. Which is why when a story like James “Rhio” O’Connor’s comes along, it is so filled with inspiration and determination that it reinforces the very ground we humans stand on – that we are strong and we will persevere even when times are bad and the path ahead seems unclear. James O’Connor is truly an incredible person. After he was diagnosed with pleural mesothelioma and was told by his doctor he only had a year to live, O’Connor decided to take matters into his own hands. He set to work investigating his disease by surveying numerous specialists and researchers and talking to fellow patients. He wanted to learn as much as he could. 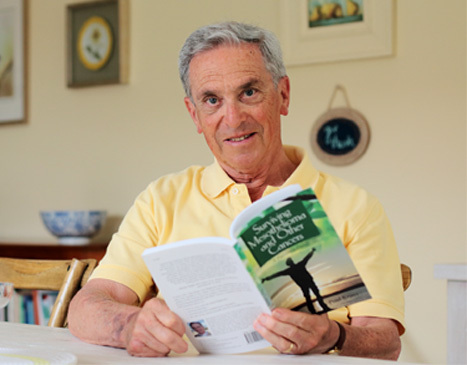 He looked into all the many therapies offered and then surrounded himself with a team of truly skilled doctors ready to help him make the most of the time he had left to him no matter what the means. It wasn’t easy. Mesothelioma is considered incurable and O’Connor was forced to make many tough decisions regarding his treatment but with his doctors and his extensive new knowledge, he formulated a course of therapy that included supplements, a special diet and mind-body medicine. With this regimen and his remarkable self-discipline, he was able to outlive his prognosis by over six years. Personally, I have had many close encounters with cancer. My grandmother died of breast cancer when I was just a toddler and my own mother was diagnosed with thyroid cancer when I was thirteen. In my mother’s case, the tumor was operable but she had just gone through a rough divorce and had to work full-time to make ends meet – cancer was the last thing she needed. Unfortunately, bad things rarely happen on our own schedule. Less than a year later, she underwent surgery, her thyroid was completely removed and she went through radiation treatment. Throughout the length of her illness, she suffered from extreme exhaustion, nausea and there were many times when she was so weak, she couldn’t even bathe herself. After surgery, medications took over her life, her prescriptions totaling several hundred dollars a month, a couple of which she will have to take for the rest of her life. Looking back on it, I wish there had been another option for my mother. She often spoke of how powerless she felt and how inadequate her treatment seemed. Since then, I’ve read cases like O’Connor’s, where cancer patients had treated themselves with alternative medicine with outstanding results. I don’t think it could have saved my mother from much of her illness of course, but surgery and radiation certainly destroyed her body. Her immune system is permanently weakened, she suffers constantly from colds and flu’s and she also has difficulty regulating her hormones resulting in sudden, unexpected seizures and difficulty in maintaining her weight. Not to mention the very large scar she bears at the base of her neck. O’Connor proves there could be a better way. We are directly responsible for what we put into our bodies both physically, mentally and emotionally. While we can’t always help our situations, we still eventually suffer the consequences of a poor quality of life. This is why it is important to do what you can to take care of yourself. If I were to be diagnosed with cancer myself, I would strive to cut out all known cancer-causing agents. Sometimes, of course, extenuating circumstances interfere. Much like O’Connor’s early exposure to asbestos, the local farmer’s field pesticides that drained into the well water where I grew up may have been the culprits for not only my mother’s cancer but also the plague of illness in that area. Unfortunate situations like this may require hard adjustments like a change in career if possible. Of course there are much easier things that everyone can do as well, like not smoking, not drinking alcohol excessively, eating square, healthy meals and controlling portions, perhaps even stepping up on cancer-fighting foods and working diligently to maintain low stress levels and a healthy peace of mind. Having a positive outlook on life is, in my opinion, one of the best things a person can do for the mind and body. Even as a healthy person, these are all things that I try to implement in my life already. I do not smoke, I only drink socially other than the occasional glass of wine or beer, never excessively and I make sure my family and I eat 3-4 small square meals a day. Stress is, of course, not nearly as easy. As a working student-mother, my life often gets away from me but when my days are at their toughest and I’m ready to just give up, I think of people like James O’Connor and I know that no matter how bad it gets, if he can do it so can I. All these things are valuable lessons to learn but the most valuable of the all would probably be the one that coaches people to be more active in their own education. Like many things in life, going through life unaware and uncaring will lead to a world of hurt. James O’Connor lived as long as he did because of the things he learned and the people he surrounded himself with. These resources were able to give him a better understanding of not only his disease but the medical profession and its inter-workings. O’Connor’s model of pooling his resources by making use of the library and reaching out to medical professionals and cancer patients alike is a lesson that should be carefully heeded. An informed consent should always be just that – informed. Not only would I try to follow O’Connor’s example in this, I would also scour the internet which is a wealth of valuable information and available at the touch of a finger; sites such as survivingmesothelioma.com which offer facts, testimonials, conventional and alternative treatment descriptions and all the latest news of the disease. With cancer already in my family, I am at an increased risk of developing some form of it myself. James O’Connor and all the people out there like him inspire me everyday to not only practice a better way of living but also to appreciate the time given to me. As humans, we forget that life does not go on forever and that bad things do indeed happen to everyone. While cancer in all its forms is a terrible disease, it does not have to be a death sentence. Everyday, new discoveries are being made and it is entirely possible that one day, cancer will no longer be a problem. But until then, we can keep empowering ourselves through self-awareness and education and perhaps through our efforts, we can turn ‘one day’ into ‘tomorrow’.